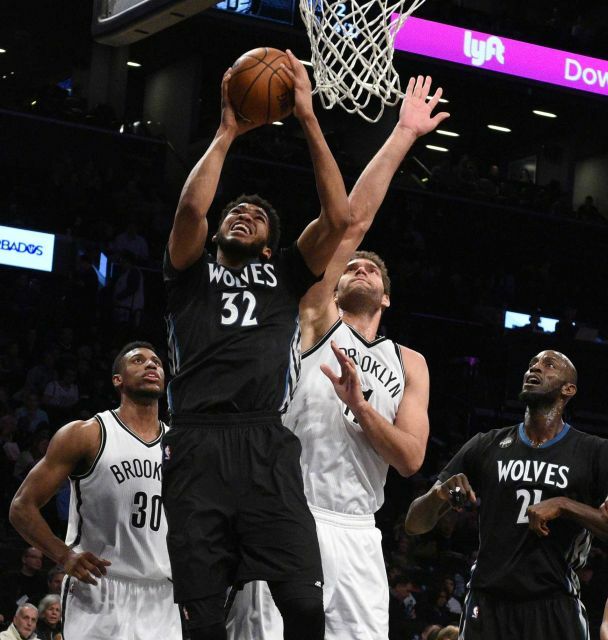 It was a slow start for both teams in the first quarter; the Nets went to Brook Lopez on the first two possessions of the game while the Timberwolves countered with Karl-Anthony Towns. Both teams shot the ball poorly during the opening minutes. Ricky Rubio set the pace for the visiting Timberwolves in the first quarter and got the offense going after the slow start. He had a dazzling behind the back assist to Gorgui Dieng near the end of the first quarter, just one of his 15 assists today. The Nets were down 10 by the end of the first. 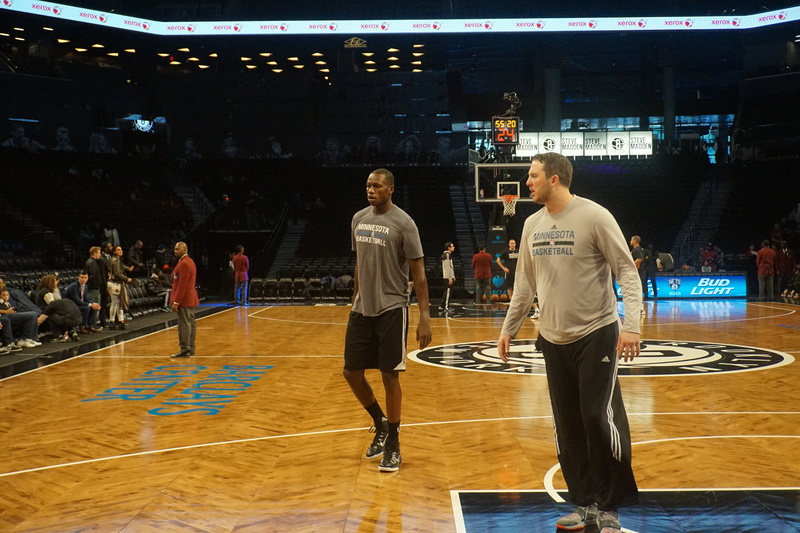 Lopez led the Nets with 8points in the period while Dieng led the Wolves with 10 points. The Wolves shot 47% in the opening period while the Nets shot a dismal 28%. Kevin Garnett was active in the huddle for the young Wolves during time outs once again providing veteran leadership. The second period began with much of the same the Wolves and Gorgui Dieng continued to go inside. Dieng was very effective in the first half. Andrew Wiggins did not shoot particularly well but did score 11 points in the half and finished the game with 16 points. The Nets seemed to go away from Brook Lopez in the second quarter, he did not score until 1:42 left in the half on free throws after a Gorgui Dieng foul and he only had two shot attempts. Thaddeus Young had a rough start to the game in the first half, as he was assigned to the bigger Dieng who finished the half with 16points and 6 rebounds. To put that in perspective he averages 8points per game on the season. Karl-Anthony Towns came alive at the end of the first half with 5 consecutive points in the final minutes on a fast break dunk and then a layup as he was fouled. Towns returned to the place where he was drafted and had one of what is becoming his routine games. He has proven that he was a valid number one pick in the NBA draft as he is in the running for the Rookie Of The Year award. The second half began with the Nets going back to Lopez. Towns also picked it up in the 3rd period. He was very active and opened up the second half with 7 points. The Wolves once again built a 10-point lead after Tayshaun Prince hit a jump shot from the left wing to give the Timberwolves the 63-53 lead. By the end of the third period Towns had 19 points and 8 rebounds and he was in a groove, he had 9 points and 3 rebounds in the period. The Nets poor shooting continued and they could not cut into the lead and were down 10 at the beginning of the 4th 75-65. Joe Johnson had only 2 points through the third as he continues to struggle offensively this season. The story of this game was the battle in the middle. Lopez went up against Towns and Dieng; all three had great games for their respective teams. Lopez contributed 20 points, 12 rebounds and 2 blocks in the losing effort. The Wolves had their biggest lead of the game in the fourth as they went up by 20 after a jump shot by Karl-Anthony Towns. Towns finished the game with 24 points 10 rebounds and 2 blocks, Dieng finished with 20 points and 10 boards as well. Andrea Bargnani had another solid game tonight off the bench as he added 11 points, Wayne Ellington, Thaddeus Young and Bojan Bogdanovic all finished with double digit figures in scoring. The Nets lacked effort and energy on both ends of the floor Brook Lopez spoke about the Nets not playing a complete game. Coach Lionel Hollins who took the blame for the loss, stating that he “took responsibility for us not being out there and ready to go”, echoed those thoughts. 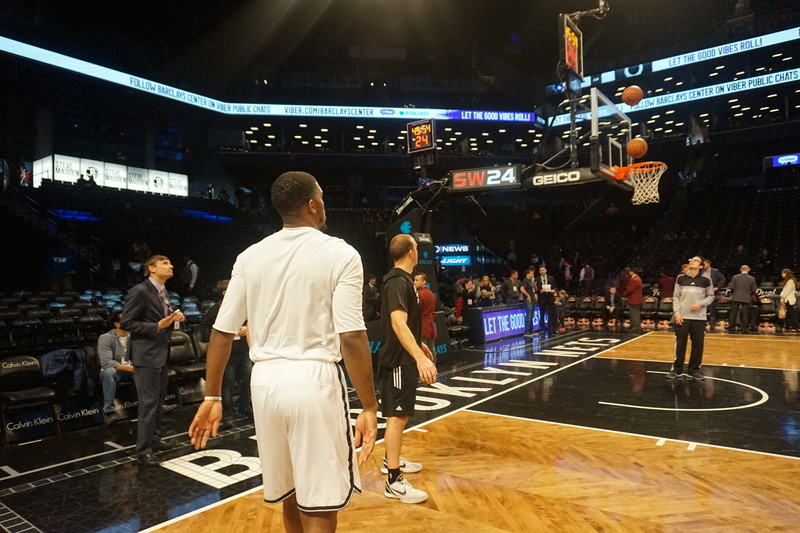 Joe Johnson spoke about the team’s challenges on the defensive end of the floor. He said that players need to “take a challenge defensively,” and that it should be a team effort. Johnson also spoke about how tough it was to experience these many losses, he stated “it’s been tough for me, not starting tonight or last week,” the losses are tough to swallow. The Wolves improve to 11-16. Their young nucleus is beginning to gel. Wiggins, Towns and Zach Lavine continue to show improvement every time they step on the floor. The Timberwolves future looks bright if those three can continue to make strides on both ends of the court. The Nets now fall to 7-20 with a game against the Chicago Bulls tomorrow who are also coming off a tough loss against the Knicks. The Nets will look to rebound from this loss and look to get back on the winning track.